Some things I catch onto quickly, others, not so much. Take the gym I use. It’s big and up to date, well lighted and filled with, uh, “interesting” people. I enjoy going there and I love the machines that record everything about my exercise sessions. I wouldn’t call what I do a workout because so far I’m too slow and too puny to work anything out without a calculator. (That was a little gym joke for you–hope you enjoyed it.) But I’m working on it. There are some down sides to such sophisticated technology. For one thing, I have become painfully aware of how much physical activity it takes to burn off 100 calories. You’d think that would put me off eating Twinkies, but it hasn’t. But I’m working on it. I did catch on to how to use the equipment–I had been going to another gym and had a brief orientation to the machines. they even have pictures on them for heaven’s sake that explain how they’re used. I guess they want to include the illiterate–or the non-English speaking. You know how that works if you’ve assembled some self-assembly furniture lately. 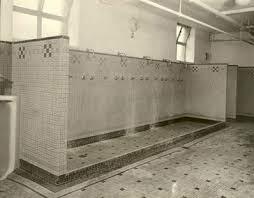 So, I’m happy to report that I have been using the showers and have been thinking about that awful time in my life know as intermediate school when we were all introduced to the horror of showering with other naked people our age. I remember some fellows would hold a towel in front of their unmentionables the entire time so that part never got wet. And some of my women friends in high school told me about a terribly awkward young lady who showered in her gym suit, such was her modesty. How she dried it at school I have no idea. In our culture we have lost traditional rites de passage which mark the boundaries between childhood and adulthood. Used to be that boys moved from knickers to long pants about their thirteenth birthday, and girls started using cosmetics. That’s still the case, and there are more formal ceremonies still such as bar and bat mitzvahs. Now our rites of passage tend to be institutional rather than cultural or religious, if I can make that distinction. The passage into adulthood is measured ostensibly by earning a drivers license or graduating from high school. But I would suggest that being able to shower in a shared space without too much self-consciousness is a true mark of adulthood. I still don’t have the self-confidence to parade in my birthday suit through the locker room (and since I have a dad bod it wouldn’t be a pretty picture), so I wrap the biggest towel around me and make my way to the showers which are not communal, but arranged so that they’re semi-private and no one need see anyone else in the altogether. I just wish we had had such an arrangement when I was thirteen.